Walker Bay 8 Dinghy Covers: Flat cover is an excellent fitting cover with super durable materials, ideal as a top cover for storage, towing or roof racks. 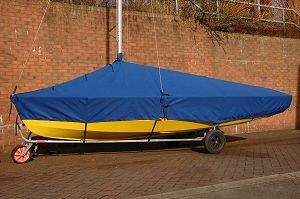 All our Walker Bay 8 Dinghy Covers are manufactured in our factory in Southampton, we do not sell imported covers. We use only the best quality materials whether PVC, Polyester/Cotton, Hydralite, Nylon or Weathermax.